One of the first things seven-year-old Louis XIV did as France’s King was to give away a set of exquisite medieval tapestries. As an adult, the Sun King wouldn’t make the same mistake. During his 72-year-reign, Louis XIV amassed history’s largest tapestry collection, a staggering 2,650 plus pieces. Only England’s Henry VIII came close. To mark the 300th anniversary of Louis’ death, fifteen of his treasures unfurl for “Woven Gold: Tapestries of Louis XIV” at the J. Paul Getty Museum in Los Angeles (December 15 through May 1, 2016). 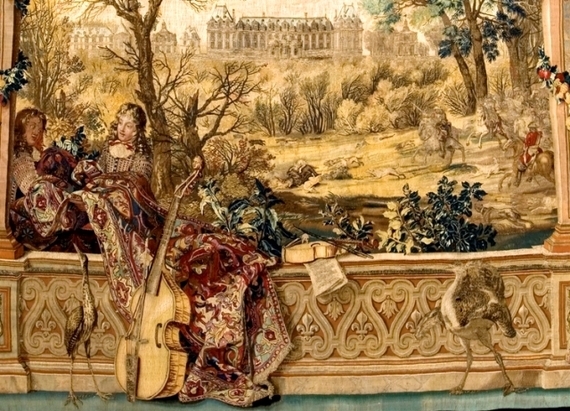 Most of the tapestries have traveled from Paris’s Mobilier National, repository for 600 of the roughly 700 surviving pieces of the royal collection. Located in Paris’s 13th arrondissement, the little-known institution furnishes the Élysée Palace, ministries, and embassies. Created in weaving workshops across northern Europe, the featured tapestries date from about 1540 to 1715. Eleven are making their U.S. debut; two recently underwent conservation with the Getty’s support. Fittingly, Louis himself opens the show in a fabulously opulent state portrait by Hyacinthe Rigaud. 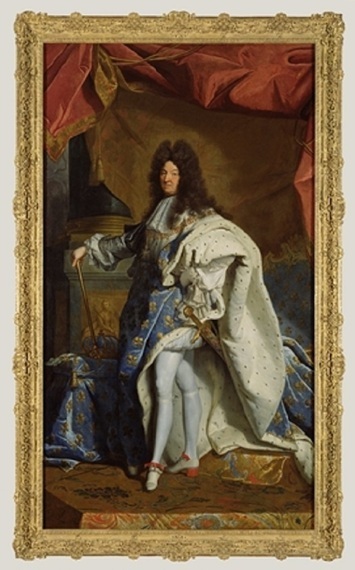 Shod in high red heels and draped in an ermine and blue-and-gold fleur-de-lis coronation robe, the king’s likeness was so popular it was reproduced numerous times by Rigaud’s workshop. Louis’ monumental textiles are organized into three groupings — his acquisitions, inheritance, and commissions. Woven in luxurious, vibrant wool and silk after designs by renowned artists like Raphael, Rubens and Charles Le Brun, the royal tapestry collection was the highest expression of Louis XIV’s power, wealth, and taste. As such, it didn’t fare too well during the French Revolution when many were dispersed or burned for their precious gold and silver threads. One of the extraordinary tapestry sets Louis XIV acquired from the nephew of his first minister, Cardinal Jules Mazarin, was “The Acts of the Apostles” after Raphael’s celebrated ten work cycle for the Vatican’s Sistine Chapel. Louis’ uncle by marriage, England’s Charles I, commissioned the series from the Mortlake workshop outside of London, and his purchase affirmed the dynastic ties between France and Britain. On view from this series is “The Miraculous Draft of Fishes” where Jesus tells Peter and his apostles, “Thou shall be fishers of men.” With thread and loom, the talented Mortlake weavers achieved the painterly effects of the rippling water of the Sea of Galilee and the reflections of the boat and fishermen. Price was no object as Louis’ agents combed Europe for the finest Renaissance and Baroque tapestries. Another of the king’s most prized and priciest buys — “The Story of Scipio” series — was woven in Brussels in the mid-16th century after a design by Raphael’s colleague, Giulio Romano. Dispersed during the French Revolution, four of the ten pieces in the series entered William Randolph Hearst’s collection in the 1920’s; a fifth went to the Cincinnati Art Museum (the whereabouts of the other five pieces remain a mystery). “The Reception of the Envoys from Carthage” on loan from Hearst Castle depicts the triumphant Roman general Scipio in his star-studded blue cloak receiving his enemy’s envoys. Combining military skill and magnanimity, the Roman general was a popular symbol of ideal princely behavior. According to Bremer-David, Henri IV jumpstarted tapestry production in France and many workshops were producing hangings in Paris during his grandson’s reign. But it was the Sun King’s decision to establish a royal tapestry factory in 1662 that proved a game-changer. Jean-Baptiste Colbert, mastermind behind the king’s coveted art collection, unified the Flemish weavers working in Paris at the Gobelins factory. Some 250 of the best weavers worked exclusively for the king at Gobelins under talented royal painter Charles Le Brun. Le Brun would also transform a run-down royal hunting lodge into the world-famous Versailles. France’s royal residences inspired Le Brun’s spectacular tapestry cycle, “The Royal Residences/The Months of the Year” featuring a dozen chateaux and seasonal court activities. “The Chateaux of Monceaux/Month of December” depicts Louis XIV leading a boar hunt, while a menagerie of exotic birds inhabits the foreground. Hanging nearby is the Getty’s own version of the same scene woven for a private patron. Museum founder J. Paul Getty began acquiring textiles in the second half of the 1930s and later visited the Gobelins factory. When he opened his Malibu museum in 1954, French tapestries were among the highlights. Textiles played a powerful role in the highly choreographed coronations of Louis XIV and his great-grandson, Louis XV. As Pascal-François Bertrand, art history professor at the Université Bordeaux Montaigne, describes in his catalogue essay, it took eight carriages to transport some 500 tapestries from Paris to Reims for Louis XV’s coronation in 1722. A new set of Gobelins tapestries decorated Louis XV’s bedchamber at the archbishop’s palace, writes Bertrand, and tapestries lined the route to Reims Cathedral. Inside the cathedral, extra chandeliers and sconces had to be hung after tiers of tapestries covered the windows. Weaving these monumental textiles was a huge, costly endeavor. Depending on the complexity of the design, a skillful weaver produced just one to six square meters of tapestry a year. According to Bremer-David, several weavers could work side by side at a loom, often specializing in people, animals, plants, and architecture. The show’s cache of preparatory works includes an enormous canvas cartoon used for “The Triumphal Entry into Babylon” tapestries. From the Italian cartone, cartoons were full-scale paintings on paper or cloth, cut into vertical strips and attached to the back of the loom as guides for weavers. Looking carefully, you can see the seams reconnecting the vertical strips of the cartoon. A small group of weavers continues to make tapestries the old fashioned way after designs by contemporary artists. For “Diptypque I” woven at Beauvais, Raymond Hains designed a computer screen topped by a tool bar. One open window features “Bacchus and Ariadne” by 17th century painter Eustache Le Sueur. 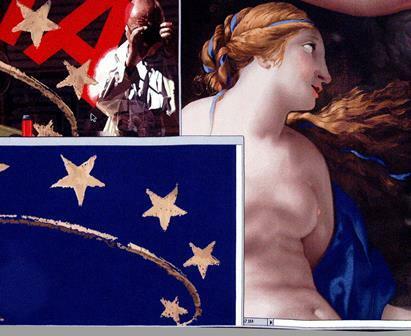 Another depicts a gold tiara and stars – a reference to the constellation created when Bacchus flung Ariadne’s crown into the sky.